The Wensleydale Creamery, the famous Yorkshire Dales cheese-maker, is celebrating after another successful year at the Great Yorkshire Cheese & Dairy Show. 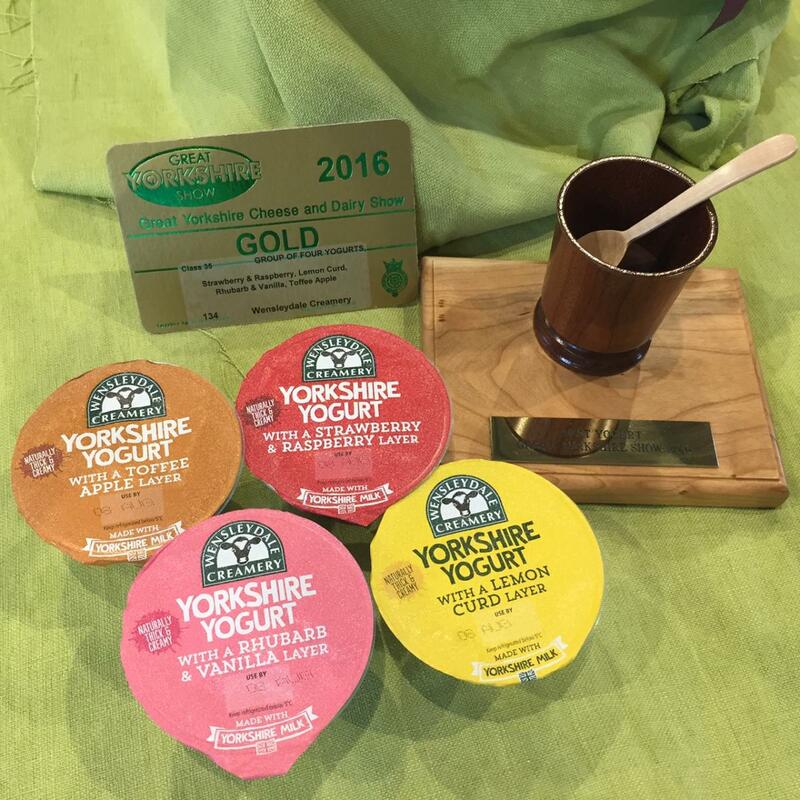 The Creamery picked up a grand total of 15 awards, with a GOLD and ‘Best in Category’ award for its Yorkshire Yogurt (range of four flavours). Held on Tuesday 12th – Thursday 14th July in Harrogate, the Great Yorkshire Show is one of the UK’s leading annual events, attracting over 130,000 visitors during the three-day celebration of the region’s agricultural heritage. The Cheese & Dairy Show, held in the new food hall on the showground attracted over 760 entries from across the UK and abroad. The Wensleydale Creamery picked up a host of medals across the show for their handcrafted cheeses and yogurt, beating a competitive field of dairy producers to win four GOLDS, seven SILVERS and four BRONZE awards. The Creamery’s recently launched Mature Cheddar with Black Sheep Riggwelter Ale and Yorkshire Wensleydale & Limoncello both won GOLD awards, as well as a top SILVER accolade for its brand new coloured blue cheese. David Hartley, Managing Director at The Wensleydale Creamery, said: “We’re delighted with the results and in particular, our GOLD and ‘Best in Category’ award for our range of Yorkshire Yogurts which are made with Yorkshire milk; they’re naturally thick and creamy, with nothing added except for a delicious fruit compote layer, as well as a SILVER for our new plain Yorkshire Yogurt variant, launching soon. Our haul of 15 medals really topped off a great sunny day at the show. The award-winning Wensleydale Creamery, based at Hawes in Wensleydale, in the heart of the Yorkshire Dales National Park, is home of the famous Yorkshire Wensleydale cheese. It is renowned for its traditional cheese-making skills as well as being innovative with the development of new cheese and dairy products. Hi Michelle, the yogurts are stocked in a number of Asda, Tesco and Co op stores in the north, and a number of independent farm shops and delis including Mainsgill Farm Shop (off the A66) and Campbell’s of Leyburn.